Want to own a piece of history? Here's your chance. Want to own a piece of history? Here’s your chance. The 135-year-old Maryland House of Correction was one of the oldest maximum-security prisons still in use when it closed in 2007. In 2011, the Department of Public Safety and Correctional Services, with CAM Construction embarked on one of the largest inmate construction projects in the country — deconstructing—rather than outright demolishing— the structure. More than 120 inmates were trained in different areas of construction, including asbestos removal and confined space practices. In the end, the decision to deconstruct rather than demolish, saved an estimated $5 million; 90 percent of the materials were reused. Including bricks, which were meticulously removed one at a time. 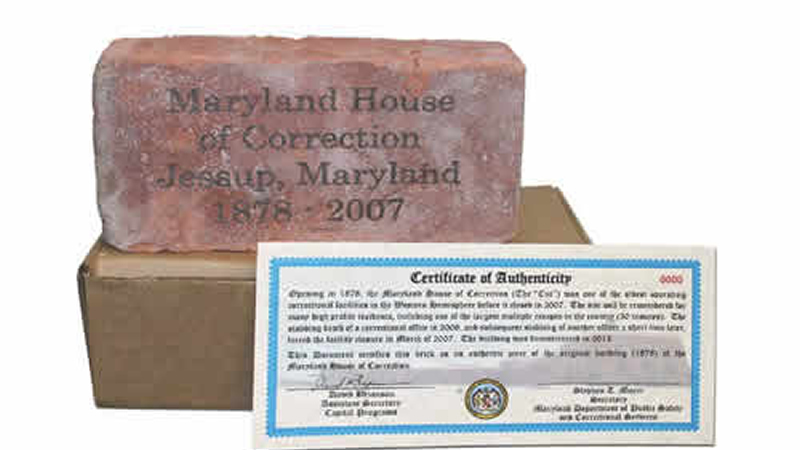 For former employees, or anyone interested in owning a piece of Maryland History, bricks from the former House of Correction are now available to purchase for $7.